Walter Lawrence Trophy Rewards at Lord’s! 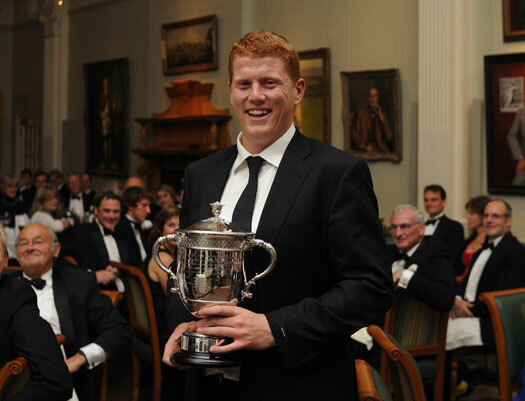 Kevin O’Brien, the hard-hitting Gloucestershire and Ireland batsman, received the 2011 Walter Lawrence Trophy – supported by Veuve Clicquot –for his 44-ball hundred at the traditional presentation dinner in The Long Room at Lord’s on October 18. O’Brien, who thumped 9 sixes and 7 fours in his hundred, finishing with 119 off 52 balls, was presented with the Trophy and a cheque for £5,000 from former England and Somerset all-rounder Vic Marks, who was guest speaker for the evening. the presentation dinner in The Long Room at Lord’s. Reviving memories of his scorching 50-ball World-Cup century for Ireland against England in March – the fastest in the competition’s history – the 27-year-old Dubliner and his Gloucestershire opening partner Hamish Marshall, whose 53-ball ton in the t20 South Group match at Uxbridge on June 26 made him the Trophy’s runner-up, put on an awesome opening stand of 192, the highest partnership for any wicket in domestic T20 cricket. Now in its 77th year, the Walter Lawrence Trophy, awarded for the fastest hundred of the season, is open to all domestic county competitions as well as One-Day Internationals, Twenty20 Internationals and Test Matches in England. The Walter Lawrence Trophy award for the highest-scoring batsman from the six MCC Universities was won by Durham’s Chris Jones, who recorded a monumental 252 not out in the MCCU Championship match against Oxford at The Parks on April 22. 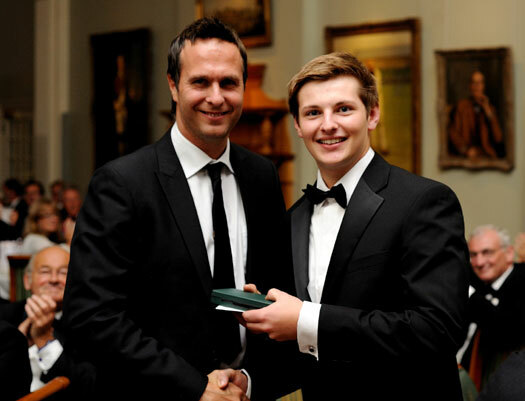 The 20-year-old opener, whose unbeaten double century was scored off 271 balls and included 40 fours and one six, received a silver medallion and prize of £1,000 from Mike Griffith, MCC’s Chairman of Cricket. 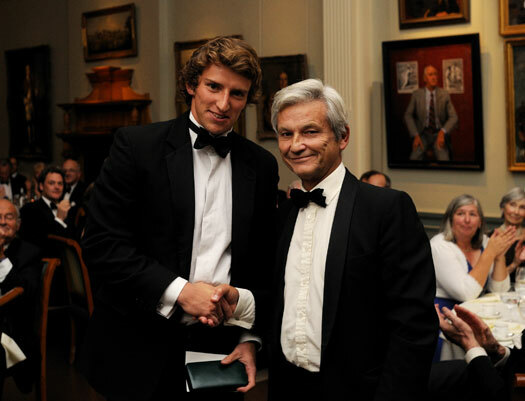 Rising star: Durham MCCU’s Chris Jones (left), whose unbeaten 252 won the 2011 Walter Lawrence Trophy award for the highest scoring MCC Universities batsman, receives the special silver medallion and a cheque for £1,000 from Mike Griffith, MCC Chairman of Cricket, at the presentation dinner in The Long Room at Lord’s. Jones, who also plays for Somerset, is the first Durham University batsman to win the award, which is for the highest scorer in an innings played against one of the other five MCCUs or against one of the first-class counties. His 252 is the highest score recorded since the award was introduced in 2006. Lastly, a new award launched by the trustees of the Walter Lawrence Trophy this season for the highest score by a school batsman against MCC, was won by Stuart Parsons of Reading School. Chasing an MCC total of 299 for 9 declared, the 17-year-old went on to make an unbeaten 212, scored off 182 balls and including 40 fours, out of his school’s winning total of 300 for 1. Parsons received £250 and a special medallion from former England captain Michael Vaughan who also delivered an inspirational speech. £250 from former England skipper Michael Vaughan.